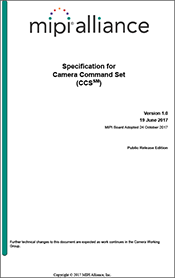 MIPI Camera Command SetSM v1.0 (MIPI CCSSM v1.0) defines a standard set of functionalities for implementing and controlling image sensors. It enables rapid integration of basic camera functionalities in plug-and-play fashion. It also gives developers flexibility to customize their implementations for more advanced camera and imaging systems. MIPI CCS is offered for use with MIPI Camera Serial Interface 2 v2.0 (MIPI CSI-2SMv2.0), which has been widely adopted by developers around the world to reduce the integration requirements and costs of deploying camera and imaging components in mobile devices. MIPI CCS brings added conveniences to MIPI CSI-2, enabling developers to further reduce integration requirements and costs for complex imaging and vision systems. MIPI CCS enables developers to craft a common software driver to configure the basic functionalities of any off-the-shelf image sensor that is compliant with MIPI CCS and MIPI CSI-2 v2.0. The MIPI CCS specification provides a complete command set that can be used to integrate basic image sensor features, such as resolution, frame rate and exposure time, as well as advanced features such as phase detection auto focus (PDAF), single frame HDR, or fast bracketing. As a specification designed for use with MIPI CSI-2 v2.0, MIPI CCS is backward compatible with earlier versions of the MIPI CSI-2 interface. Visit the MIPI Alliance website to learn more and see MIPI's entire portfolio of specifications.